With ever-expanding technological capabilities, it can be a struggle for any country’s defense department to stay ahead of the game. The U.S. Department of Defense has continued its push to think outside the box when it comes to keeping U.S. interests safe — from drone ships to the developing Space Force, the DoD is innovating like never before. But one recent development, still in the early stages, doesn’t depend on the most up-to-date technology to protect the U.S.’s most valuable assets. Instead, the Defense Advanced Research Project Agency (DARPA)’s newest initiative is relying on millions of years of evolution by using marine animals, including bioluminescent plankton, to detect and respond to human activity. Marine biologists and others who spend their time with aquatic creatures have noticed that even the smallest organisms can respond to threats from miles away. For example, some microbes are considered “magnetotactic,” which allows them to react to the magnetic signals issued by submarines and other underwater vessels, sometimes from miles away. PALS researchers believe that if they can learn more about how to detect these microbial changes using military equipment, the Navy, Coast Guard, and other branches of the military can deploy these microbes as a first line of defense to detect enemy vessels where sonar is unavailable. Because sonar “pings” can be picked up by other countries’ military surveillance systems just as easily as they can by ours, using sonar as a means of detection can sometimes give away the issuing vessel’s location. Because there are literally hundreds of billions of magnetotactic microbes in the ocean at any given time, it should be all but impossible for enemy forces to realize that they’re being monitored by microscopic bacteria. Bioluminescent plankton and even giant grouper and black sea bass are other organisms that have shown their propensity to react to unfamiliar presences in their habitat. Current military surveillance technology has already picked up on these reactions but doesn’t yet have a way to measure different animals’ reactions or use them to predict the paths or distance of enemy ships. Although it’s unlikely the Department of Defense will be deploying giant fish to attack the U.S.’s enemies anytime soon, DARPA officials are excited about the practical application of PALS research. 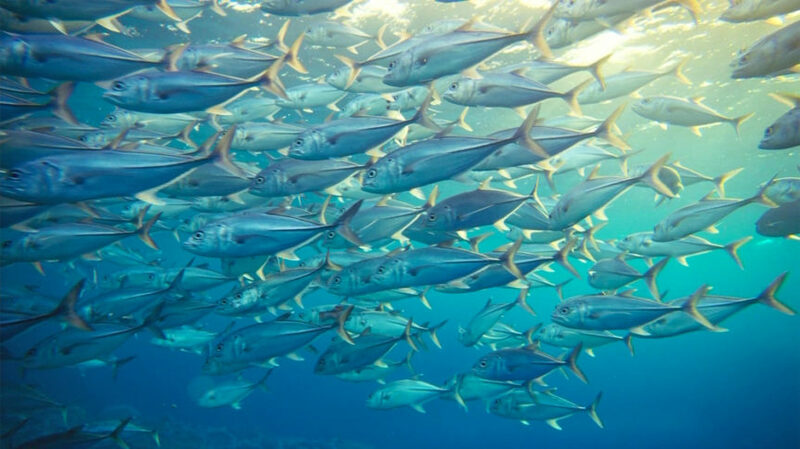 Already, marine organisms hold several major advantages over existing sonar technology: they’re naturally renewable, they’re already “deployed” throughout the ocean, and they can detect sound, magnetic fields, visual cues and changes, and light. Once DARPA determines the best way to monitor these sensitivities, marine organisms may become the go-to line of defense when it comes to protecting expensive or sensitive underwater installations.